Answer: Well, I don’t normally do movie reviews in Sky Lights. And I haven’t seen Apollo 18, nor do I intend to (based on the reviews). That said, I recently visited the Houston Space Center and got my second opportunity to see a Saturn V Moon rocket in person. Photo above. Fish-eye lens required. And my back was against the corner of the hanger. Seeing the Moon rocket again only reinforced my opinion about Apollo 18. Allow me to elaborate. First, NASA has affirmed that Apollo 18 is pure fiction. The Agency rejects the claim that Apollo 18 is based on video footage leaked from their “secret archives.” There were only three unused Saturn V rockets, and all are accounted for. None were launched in secret. Second, if you ever saw one of these Saturn V rockets, you’d wonder how it could ever be launched secretly. They are huge, noisy, and leave quite a trail in the sky (especially at night). Check out this video of a Saturn V launch. If you were anywhere in Florida you’d have seen it, and probably heard it. 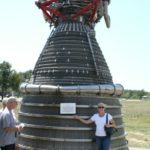 The Saturn V first stage was powered by five F-1 engines, each capable of 1,500,000 pounds of thrust, and operating at 190 million horsepower! To give you a better feel for the size of these engines, click on the thumbnail image below. That’s my wife Sandi standing next to it to provide a sense of scale. Finally, there were many obvious inconsistencies in the movie plot. I won’t play the role of “spoiler” here, as I know many people will still want to see Apollo 18, but suffice it to say the vast majority of online reviews can be summarized as “great idea, poorly executed, save your money.” The positive comments focused on how realistic the “secret video footage” looked, as it mimicked the analog video quality available in the early 70s. 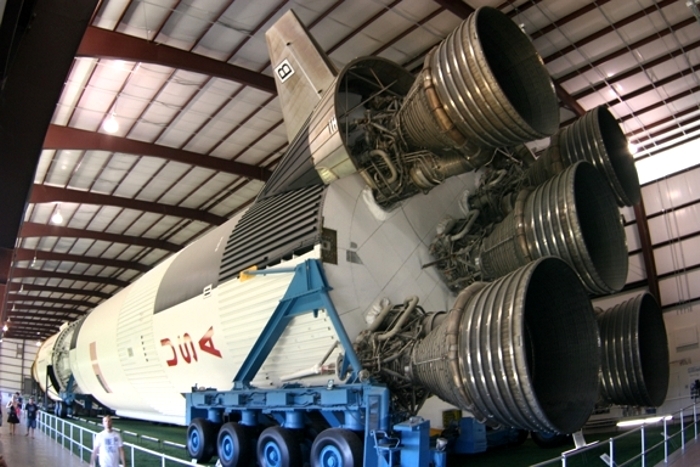 The Saturn V is best viewed in Huntsville, AL. As far as I know it’s the only Saturn V that is standing up. You really get a feel for just how big it is when you stand under it. Just go to Huntsville. You really can’t miss it, it’s visible for miles. As Apollo XVIII fictions go, though, Michener’s was the best. Totally agree. I read the book and watched the TV mini-series back in the mid-80s. They didn’t do the book justice. Would be nice if some skilled directer did it as a full length movie using today’s CGI. It was a choice of either reducing the scale of the Saturn V, or cropping the image. 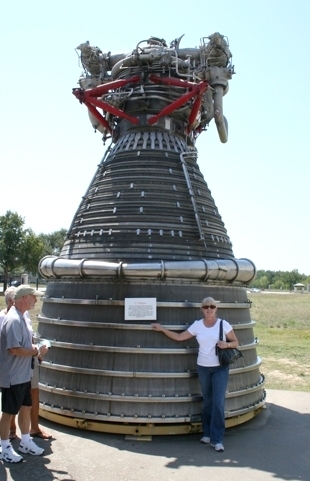 Since I had the additional photo of Sandi standing next to the engine, I chose the latter. And you can still see some people to the left of the rocket for comparison. It’s always great to have conspiracy theories shot down by facts, after all it is a movie. The pictures and size scale gave me a sense of the power the Saturn V’s had, 190 million horsepower !!! Yeah, and that’s for EACH of the 5 first-stage engines. Truly an amazing machine.